It's much quieter in and around the North Devon coastline during the autumn and winter months, into early spring. The roads, beaches, surf, golf courses, paths, trails and pubs are quieter. The heat, lush green and, at the same time, sun washed colours of summer have been replaced by the cool, moody tones and crisp colours of autumn and winter. It's a great time to visit North Devon with your dog. Although some holiday cottages aren't available during the winter months, there are still plenty to choose from for your stay in North Devon. This is especially so during the week. There can be some great offers to be had too. Keep an eye online, or phone around. You could score a great deal on your pet friendly North Devon holiday cottage. Lying on the beach and soaking up the sun has been replaced by taking a break from a long walk, in a dune wind gully, watching the sand stream across an empty Saunton beach. All the while snug and cosy in scarf and warm jacket. Even during the winter, on a sunny day, there are nooks and crannies in the dunes which act as sun traps. But don't forget some water for the dog. If you do, though, there are many fresh water pools in the dunes during winter. Drift wood is abundant along Saunton beach, washed in on high winter waves and wind. Ideal for a charged and excited dog, with endless energy and lots of space to burn it off. Diving off the rocks into the inviting summer sea, following the dog, has been replaced by finding shelter in the rocks along Baggy Point and watching the massive, grey, frothy, waves crashing and smashing. Walking to the end of baggy along the path during a stormy day can be exhilarating, but make sure the dog is on a lead! The surf during the winter months is very consistent, with some beaches often blown out and unsurfable. But, in North Devon, there is the mighty Putsborough. A great place to park and watch the waves, right next to the beach. Especially when the waves are out of control. The cafe is usually open through the winter on weekends, so get some post walk, or surf, hot chocolates in. The dog will be expecting some extra special treatment if you surf, so make sure you have plenty of sticks to throw! Colours and moody tones change rapidly through the winter day. Especially on those magic, clear sunny days when there is little wind. When chimney smoke, from old thatched cottages, rises up in a straight column. A reminder of the thatched smurf cottages in the cartoons of old! The sweet smell of burning wood or coal on a clear winter evening. The evening sunsets are a marvel, with extreme colours, and vibrance, in a cool winter sky. A great time to have a fire outside and watch the twinkling stars. If its raining, get the fire going inside the cottage and enjoy watching the flames flicker as the distant wind howls outside. Reminiscing on a day well spent, whilst the dog snoozes. And a nice glass of red, whether it be wine, or Ribena. Thinking of a winter break away in a cozy cottage? 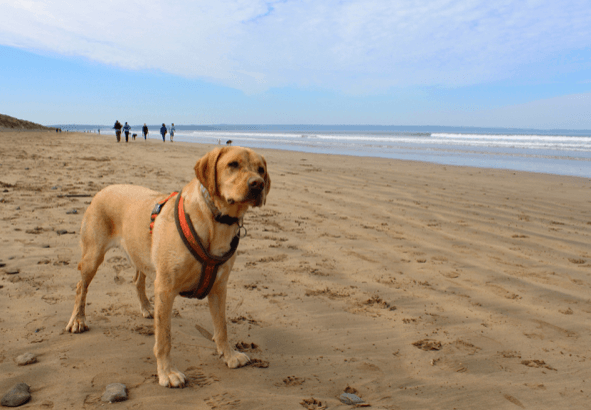 Keen to experience a quieter, more relaxed North Devon coastline and countryside with the dog? The friendly people at WoolacombeCottages.co.uk have a carefully curated selection of Dog Friendly Cottages in North Devon. Whether it may be Woolacombe, Ilfracombe, Braunton, or elsewhere, Woolacombe Cottages have a property to suit your requirements.